These oatcakes (like pancakes) are great because they are filling, healthy, and have a good chew from the oats. The creator of this recipe wanted to show how easy a high-fiber & healthy breakfast could be without butter and extra fats. The oatcake recipe can be categorized as having "no refined sugars" if you leave out the sugar which is what I did. This recipe makes 12 pancakes so having only 1 tbsp of sugar doesn't really matter; you could add more sugar if your family likes sweeter pancakes. I left out the sugar and just topped the cakes with the compote and some extra maple syrup and both my dad (who loves sugar) and I were happy with how they tasted. In the magazine, this recipe is labeled as high fiber, heart healthy, low cholesterol, and healthy weight. 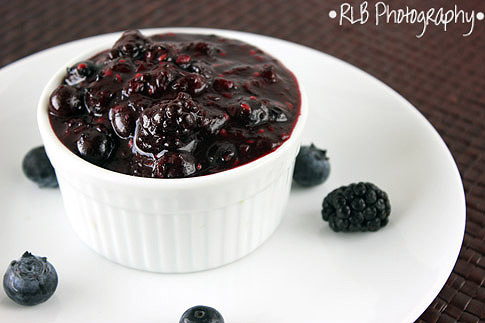 The compote recipe can be made with different berries, served with biscuits, as a healthy topping on frozen yogurt, or added into smoothies & shakes. Prepared compote can be stored in the fridge for 1 week, but it never lasts that long around here. I'm actually not a big fan of pancakes unless I make them and even then I have to top them with nuts, berry compote, or a ton of fruit: it's a texture thing. To me, the pancakes served in diners are too soft and when you add butter and syrup they seem to become a mushy, mess. Yuck.But this recipe has texture from the oats, berries, and is very good. Since this recipe isn't very sweet like most, you can have it for dinner and not feel guilty. I could eat this as is, it's that good. Oatcakes: Whisk buttermilk and egg in a medium bowl. Combine oats, flour, sugar, baking soda, 1 teaspoon cinnamon and salt in another medium bowl. Stir the dry mixture into the wet mixture and let stand for at least 15 minutes. The mixture will thicken and have lots of bubbles. Coat a griddle or large nonstick skillet with cooking spray; heat over medium heat. Using 1/4 cup of batter for each, cook 3 oatcakes at a time until bubbles dot the surface, about 3 minutes. Flip and continue cooking until browned, 1 to 2 minutes more, reducing heat if necessary to prevent burning. Compote: Meanwhile, place berries, maple syrup and 1/2 teaspoon cinnamon in a small heavy saucepan. (I used a potato masher to mash about 1/3 of the berries, but that's optional) Bring to a simmer over medium heat and cook, stirring occasionally, until the berries are mostly broken down,5 minutes. Remove from heat and set aside until ready to serve. Store leftovers in an air-tight container in the fridge for up to 1 week. *The oatcakes aren't sweet so you can omit the 1TBSP sugar (what I did) or add a few more tablespoons if you prefer it to be sweet. If you don't add the sugar (or use a natural sweetener, like maple syrup) then it falls under the category of "no refined sugar". 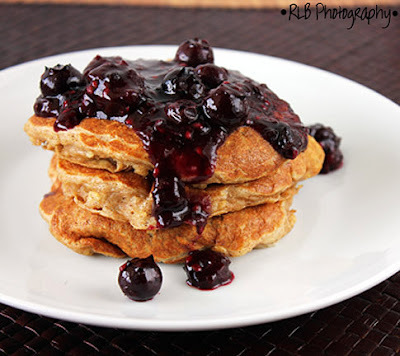 This recipe makes 12 pancakes so having only 1 tbsp of sugar really doesn't do anything for it. -It is important to let the batter sit for at least 15 minutes because the batter thickens. **The compote recipe in the magazine used raspberries, but I used what we had on hand. You can add whatever types of berries you want, fresh or frozen, but you may have to tweak the amount of maple syrup you use depending on the sweetness of the berries. That is a delicious and hearty breakfast. Thanks for topping by my space. You have a wonderful space here and happy to follow you. Seeing as we grow all our own fruits...apples, pears, sour cherries, blueberries, raspberries, blackberries, strawberries and grapes, I'm always looking for new ideas on how to use up all this fruit. When I'm not canning it all up into jams, jellies, juices, pie fillings, etc etc I'm consuming them in delicious ways. I'm going to add the compote to my repertoire and use homemade maple syrup in the recipe.